being MVP: Sticky Mosaics: Fancy Armoire Box & Giveaway! 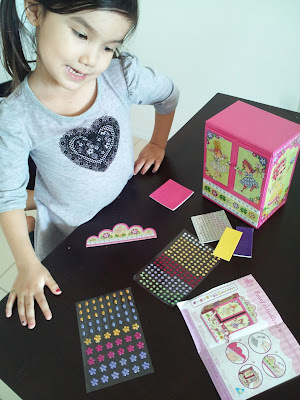 Sticky Mosaics: Fancy Armoire Box & Giveaway! My daughter is a girly girl. She loves to dress up, put on jewelry, and do her hair/ makeup. She has one jewelry box that she got when she was younger that’s a little beat up, and I thought it was time for a new one. 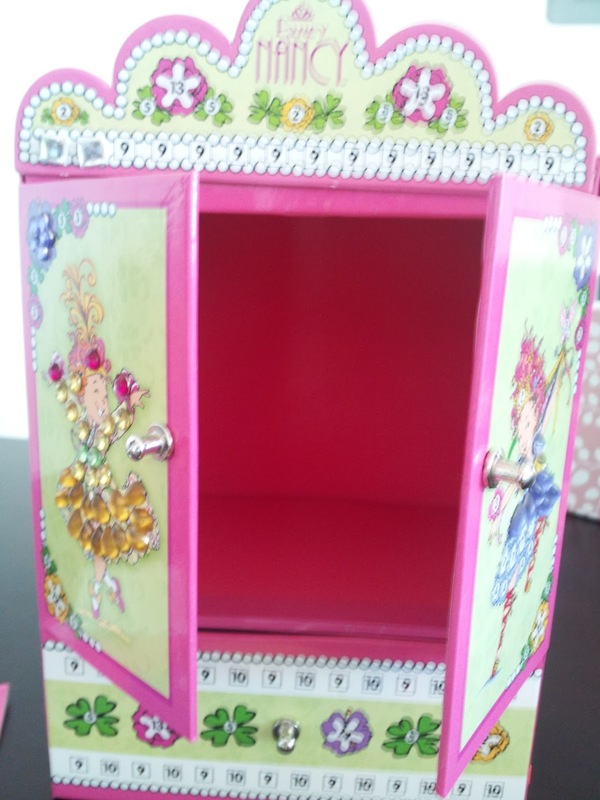 On the Orb factory website there are several jewelry boxes, but as soon as I saw that they had a Fancy Nancy armoire box, my choice was easy, since my daughter adores her. Orb Factory has several different brands. 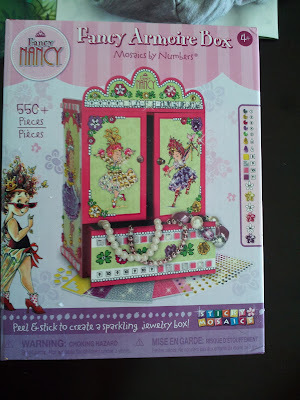 This jewelry box is Sticky Mosaics, which are similar to the ‘paint by number’ concept, except it’s tile by number, so your child gets to decorate their own box with stickers. Some of the stickers are little jewels of different shapes and colors, and some are square foam tiles with glitter. This gift is perfect for my daughter because it includes an art project, and she is very crafty. My daughter is kind of a perfectionist, and she loved this project because she could follow the directions that show you where to put everything specifically. 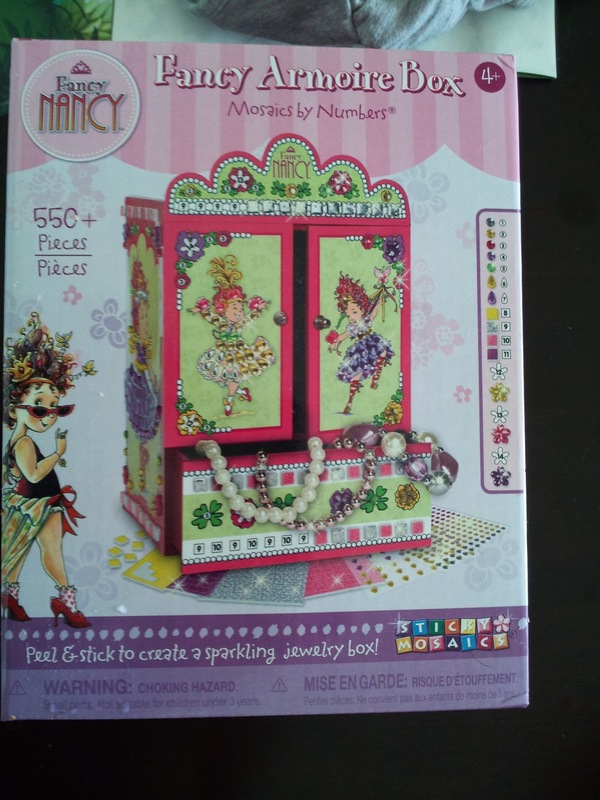 The instructions use the corresponding numbers on the armoire box to match the numbers to different colored gems, for example, every time you see a number 13, you add the pink flower gem sticker. I have bought other craft project kits for my daughter in the past, and she always finishes them so quickly, but this actually filled up the entire afternoon. I struggle to keep my daughter entertained sometimes. She is very precocious, and having a baby brother who demands most of mom’s attention a lot of the time can be difficult to keep her occupied. This project was great because she was totally focused on it. And the great thing was how totally proud she felt when she completed it. It would have been easy to just buy her a jewelry box, but this is great because she will always remember that she created it. It looked great when she was finished. It has pictures of Fancy Nancy and jewel stickers are used to decorate her dress and crown. My daughter loves anything that is bejeweled, sparkly, or glittery. She was thrilled with the way it turned out. 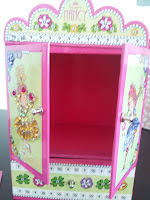 The armoire jewelry box is made of a very sturdy, cardboard like material. It has two drawers underneath. My only complaint is that when I first opened the armoire doors, I was surprised to find that there were no hooks to hang jewelry from. I have seen other armoire type jewelry boxes that have hooks inside for necklaces to hang from. It didn’t seem to bother my daughter at all. She enjoyed filling it up with her little bracelets, rings, and necklaces. 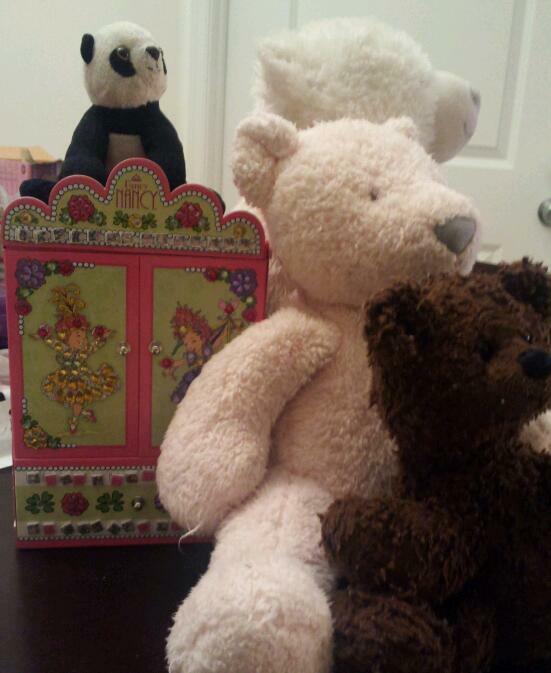 I would like to get the keepsake boxes for her, since she seems to be collecting so many ‘treasures’ these days. Sticky Mosaics has this in the room decor category on the website. They also have a ton of other ‘decorate your own’ type products. Orb Factory’s other brands have many creative gifts like this that give a child a real sense of accomplishment. Buy It: You can purchase the Fancy Armoire Box for $19.99. Make sure to connect with The Orb Factory on Facebook and Twitter! Choice of Sticky Mosaics Room Decor! I like the Heart Tiara! The mermaid kit is super cute! The Secret Keeper Boxes are adorable. the dinosaurs kit, too cute! I like the Keepsakes Box! I like the Sweet Secrets Keepsake Box. the beautiful butterflies for my niece! My daughter would love the Unicorn Jewelry Box. Thanks for the chance to win! We love the Beautiful Butterflies set. I like thier Beautiful Butterflies. The sweet secrets keepsake box is cute. My son would love the dinosaur kit! I love the Happily Ever After Jewelry Box. My daughter would love the Sparkling Unicorns set! I like the Enchanted Horses Jewelry Box . We would love the Pre School Fun Pets! I like the Sweet Secrets Keepsake Boxes. I like the Happily Ever After Jewelry Box! I would love to have the Mermaids. The Sweet Secrets Keepsake boxes look good. I like the dragons kit! My son would like Curse of the Treasure Chest. 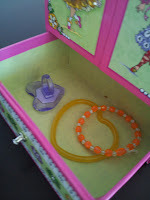 My daughter would love to have the Enchanted Horses Jewelry Box.